The New Me, part 4: cute stuff! OK, so when I started my quest to be organized back in early December, I had no idea it had the potential to become one, big, never-ending craft project! In fact, I always dreaded any type of housework because it took me away from the “creative” projects that I enjoy so much. In the last couple of months, I’ve become a little obsessed with an organizational blog called, iheartorganizing. 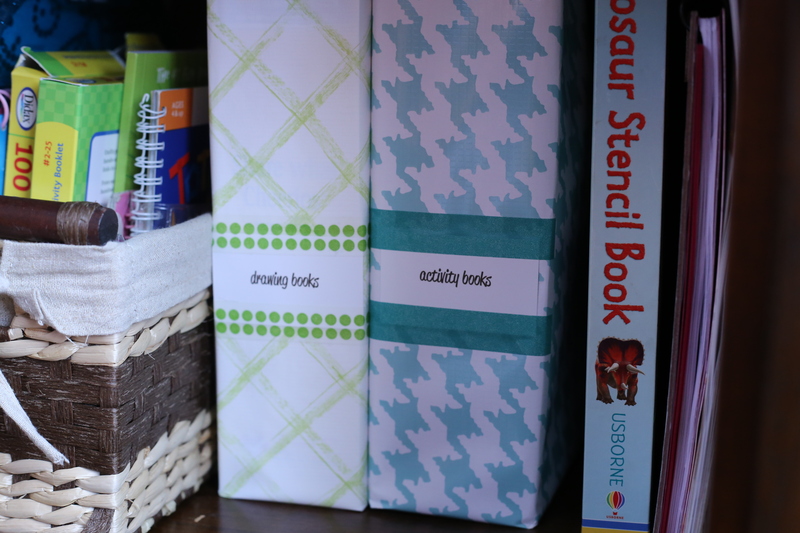 This woman has so many creative ideas for how to make organization cute that it’s crazy! Here are just a couple of ideas that caught my interest and gave me inspiration to add some craftiness to my organization. The first was a project involving “Washi tape.” Honestly, I had not heard of Washi tape before, or “decorative paper tape” as it’s called at Target. When I saw it, I just had to have some, even though I had no clue what I would do with it. I decided to use it to help me tackle my paper organization problem. 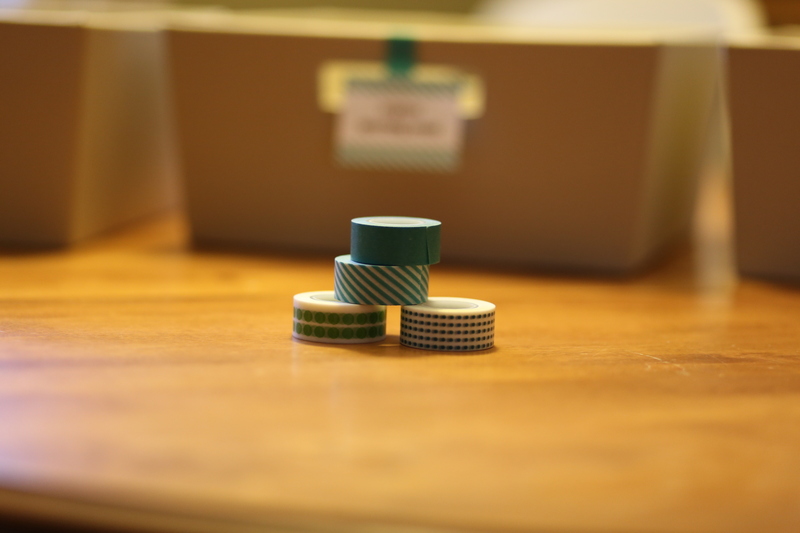 I was really tired of looking at all of our incoming paper piled up in this basket. This system was working OK. 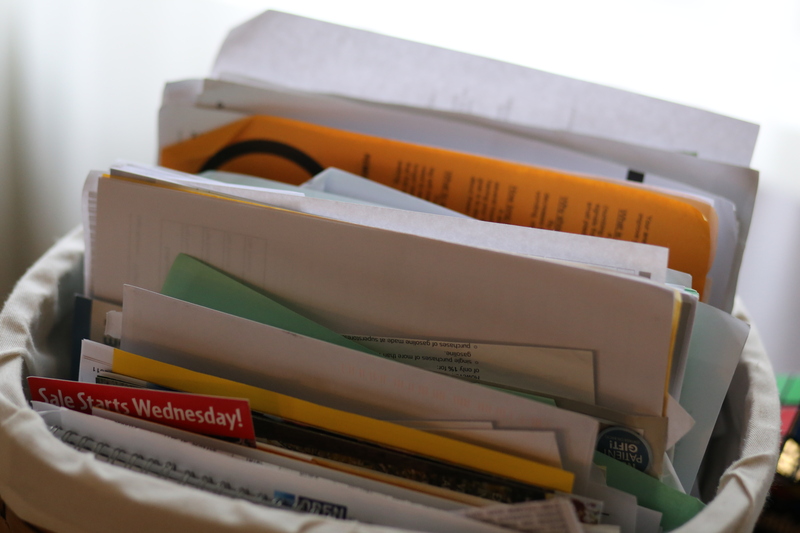 I could rummage through the basket and find the bills and then just ignore all of the other papers that had piled up there over the last few months. However, I also was going crazy to find a place for my kids to drop all of their school work when they got home and emptied their backpacks. I had tried several solutions, but always ended up with papers strewn all over the dining room table, the living room floor or the kitchen. 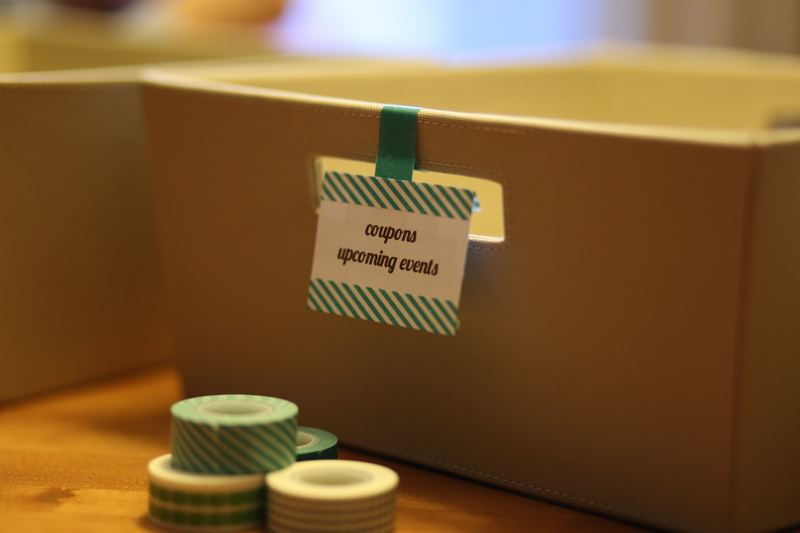 I ended up creating three incoming paper baskets, and used the decoratative paper tape to make these cute labels. One basket is for bills and stuff that needs to be filed. One is for coupons or info about incoming events… stuff that’s not urgent, but I want to save it for a short time. The third basket is where the kids can dump their incoming school work until I have a chance to look at it. I am loving this new system and I no longer have to pick up random math papers and pizza coupons from all over the house. They are neatly organized in their respective baskets. 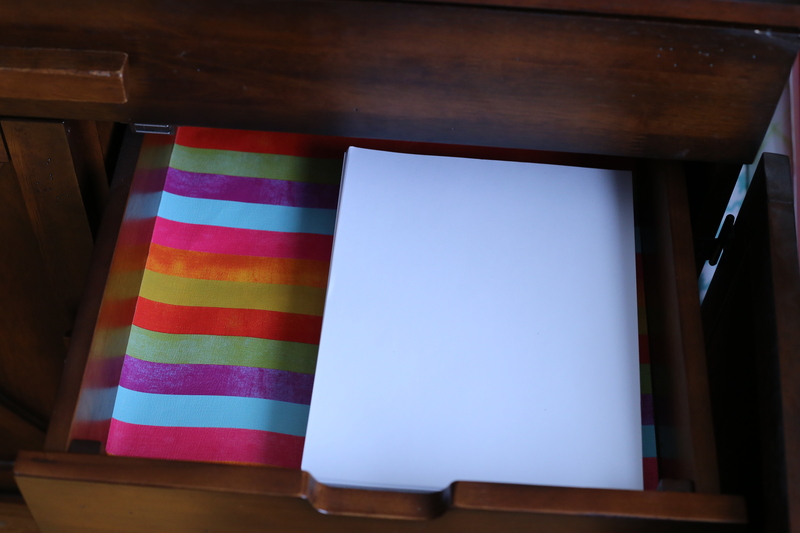 My mind also was opened to the idea of using cute paper to line the inside of drawers or for other DIY projects. 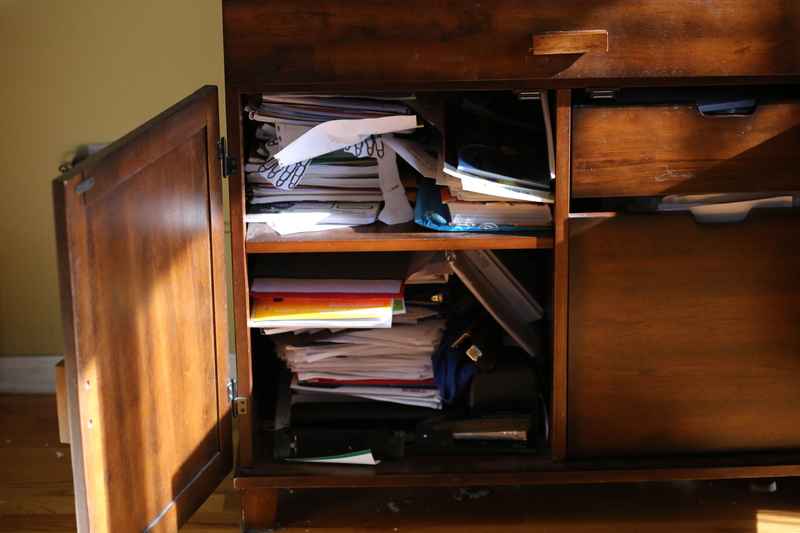 This thought would have never occurred to me before because most of my drawers were so messy that I wanted to close them as quickly as possible! 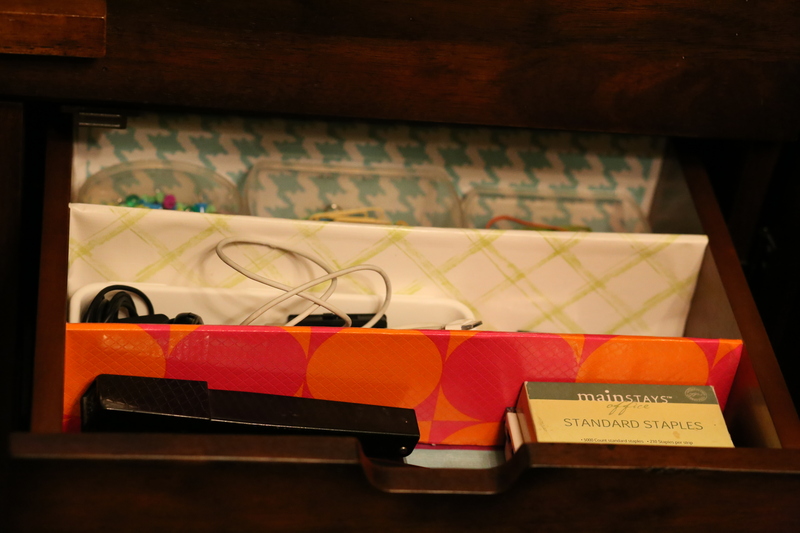 Now that my drawers are getting organized, it’s fun to get a colorful surprise when I open them! I used lots of cute paper as part of this project to regain control of this area in our dining room we had used for home schooling. Even though it’s been eight months since we finished home schooling, I just hadn’t gathered up the nerve to face all of those old school books and assignments. 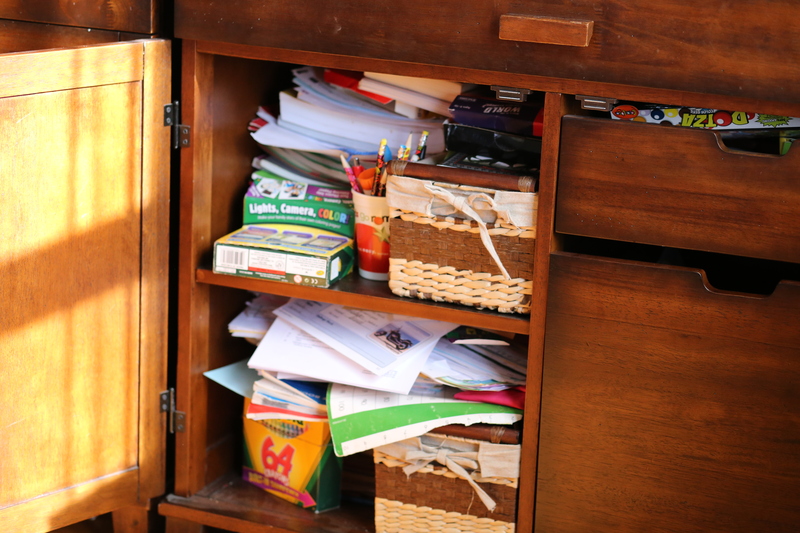 We really did have clean cabinets when we started the school year, but by the time we ended, things were a jumbled mess. Honestly, my reluctance to clean up this mess was as much emotional as it was the physical task of sorting through everything. But I did it! Now, I have some great storage for craft projects, homework supplies and educational games to keep the girls busy when I’m in the kitchen. 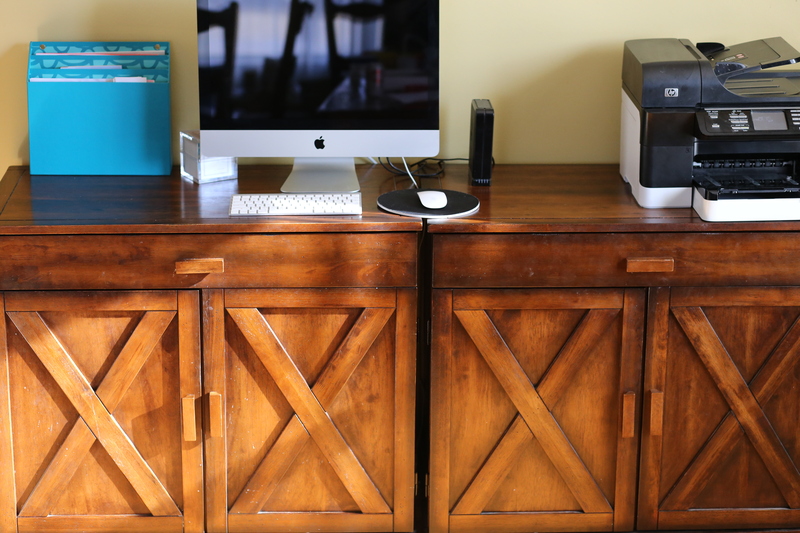 I’m sure I will come up with another use for these great cabinets at some point, but for now, this is working! 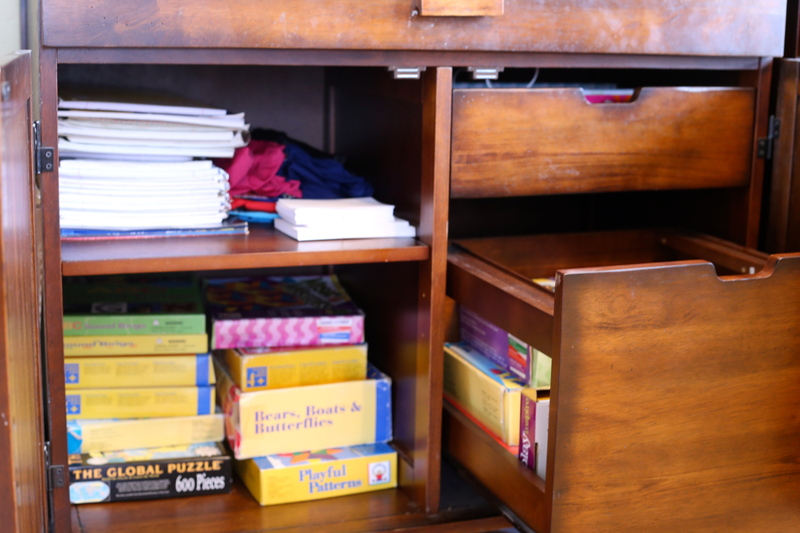 The kids are already used to going to these cabinets to do their school work, and it continues to be a good spot to store pens, pencils, erasers, rulers, paper and all of the other essentials they need to do homework. 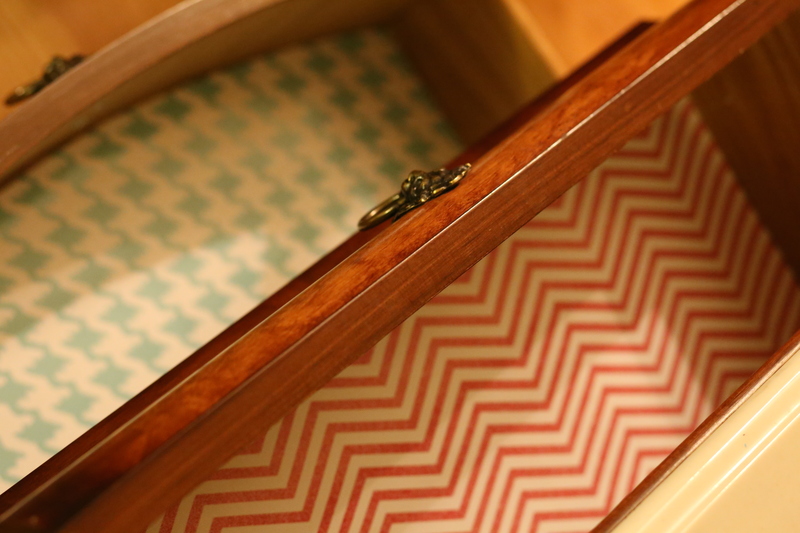 and even cover cereal boxes to create my own “magazine box” style storage. 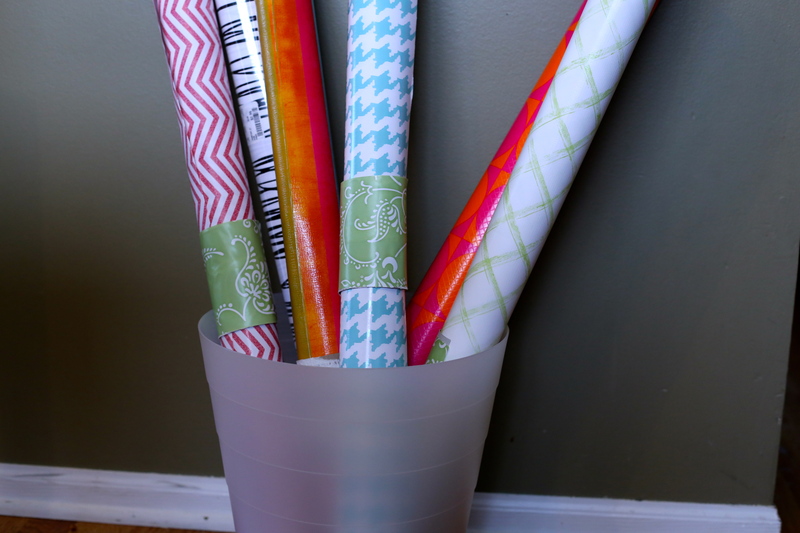 I also covered some cans to create some extra storage for our piles of colored pencils and crayons. 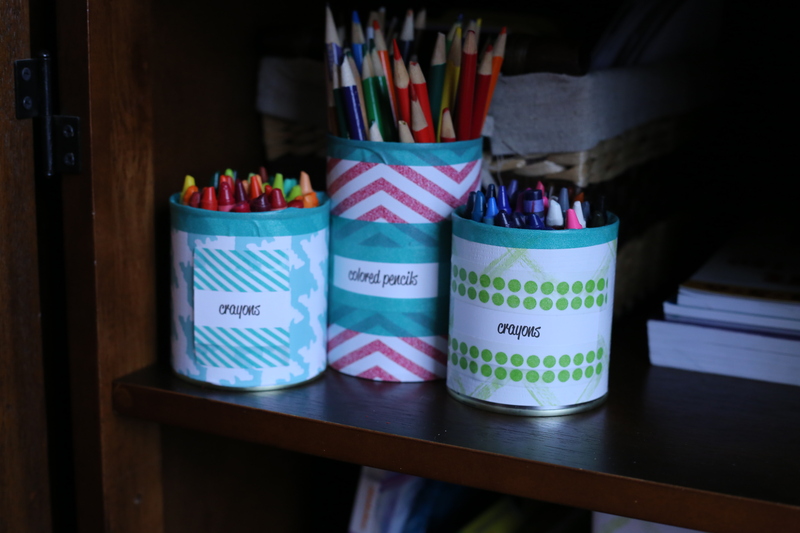 Cute, crafty AND organized. Can you believe it?? 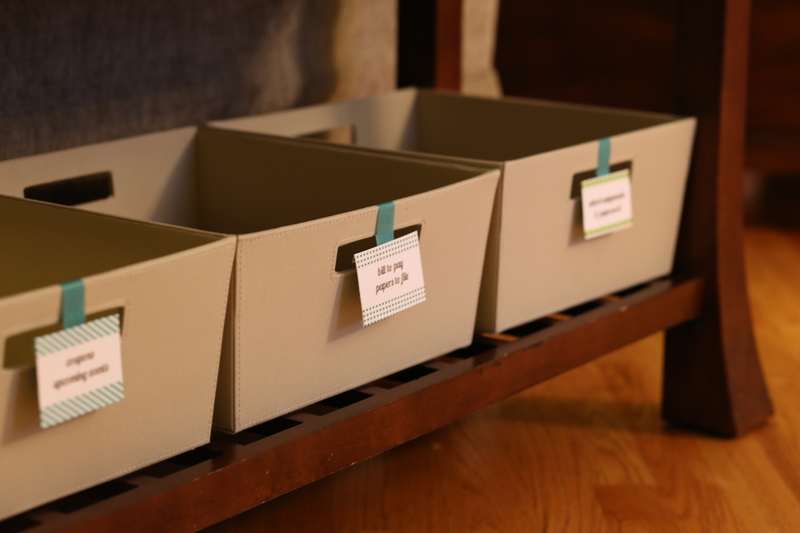 So, tell me… have you found any cute ways to organize your stuff? I would love to hear about it! Look at you! This is SO up your alley! I need to go check out that website! Kelly, you would love it! Let me know if you get totally hooked! !